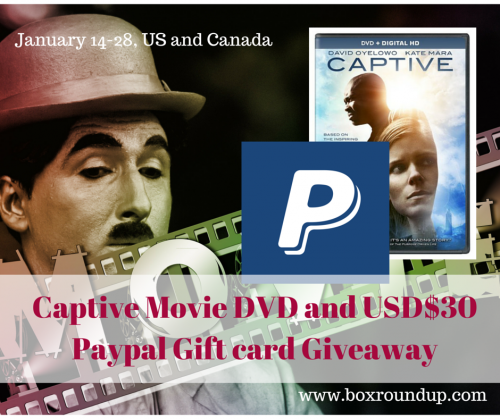 One lucky reader will be able to win his own DVD of “Captive” and a $30 Paypal gift card to make it a true movie night at home! This gift card would go a long way for snacks, or even a cosy blanket to cuddle in for watching this movie. The total ARV of this giveaway is $49.99. The giveaway is open to US and Canada residents. The gift card will be awarded in US dollars. This giveaway runs January 14 – 28. Only one entrant per mailing address, per giveaway. If you have won a prize from our sponsor Propeller / FlyBy Promotions in the last 30 days, you are not eligible to win. Or if you have won the same prize on another blog, you are not eligible to win it again. Winner is subject to eligibility verification. This giveaway is set up by Box Roundup blog. Box Roundup will be responsible for mailing $30 Paypal Gift card. Propeller Consulting LLC will be responsible for sending out the DVD. I might use it to buy a Valentine gift for my husband. I might use it to buy books. I might use it toward some bills. I would use it for a birthday gift.